This program is attempting to create a bridge between law enforcement and North Brooklyn communities. 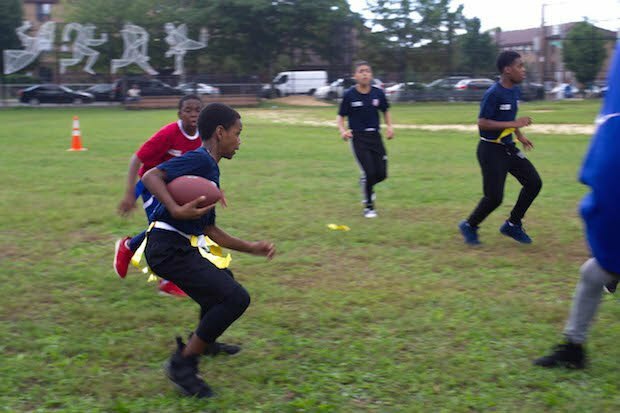 On Saturday mornings, lieutenants Michael Almonte and Thomas Hardell from the New York Police Department ditch their uniforms for sportswear to join teenagers for a game of flag football at the Sutter Ballfields in East New York. Some of their colleagues from the Patrol Borough Brooklyn North are armed with whistles, serving as referees for the games, while others lead teams, which comprise young people from the 10 precincts that the patrol borough oversees. Almonte and Hardell, both 38, who spearhead the league that launched on September 8 and runs for six weeks, hope it will not only help keep youths on the straight and narrow, but also improve relations between the police and minority communities. In six of the 10 precincts participating in the league – including those from Bedford-Stuyvesant, Bushwick, Brownsville and East New York – are in neighborhoods where at least three-quarter of the resident population are Hispanic or African-American. “We want to show the kids that the cops care about them and possibly nurture friendships. This is especially important for youth growing up in a rough neighborhood... I had a cop who was a mentor for me when I was young. We struck up a friendship when he invited me to play basketball with them," said Almonte. The biennial American Human Development Index released in June by Measure of America showed that Brooklyn North districts housed some of the highest rates of “disconnected youths” – teenagers and young adults who are neither working nor in school – among New York City districts. For instance, between 19.6 and 22.6 percent of youths in East New York, East Flatbush, and Bedford-Stuyvesant are said to be disconnected, compared to the citywide average of 14.8 per cent. Neighborhoods with high rates of disconnected youth tend to also wrestle with poverty, adult unemployment and low education levels, the researchers argue. Minority youths who live in areas with a high degree of racial segregation and underfunded schools may experience greater disconnection and fewer opportunities later in life. 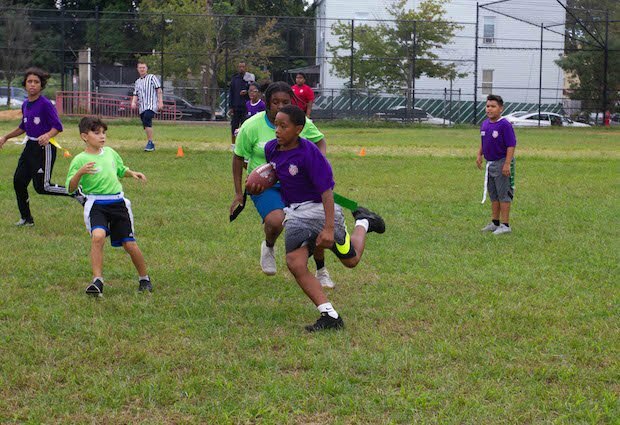 Brooklyn North's flag football league is open to teens aged 11 to 13 and every runs for two hours, with two precincts and up to two police officers joining forces on each team. Family members watch at the borders of the playing field, cheering for their young ones and often punching their arms into the air when someone scores. 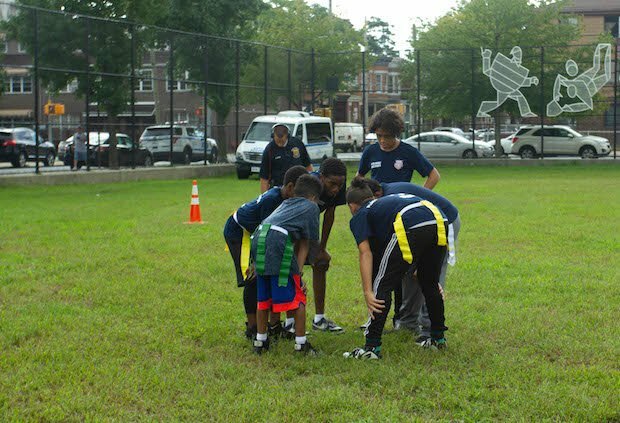 After each flag football practice, the cops from Brooklyn North spends some time debriefing the young footballers and encouraging them to embrace sportsmanship and neighborliness. Fellow Bushwick resident Sandra Young lauded the initiative for letting young people interact with law enforcement officers in a positive setting. “It is good to have this platform to let the kids understand that not all the cops are ‘bad’ people who just wants to catch them. They are only human, like us,” said Young. Her son Chance, 11, plays for the Bushwick team. 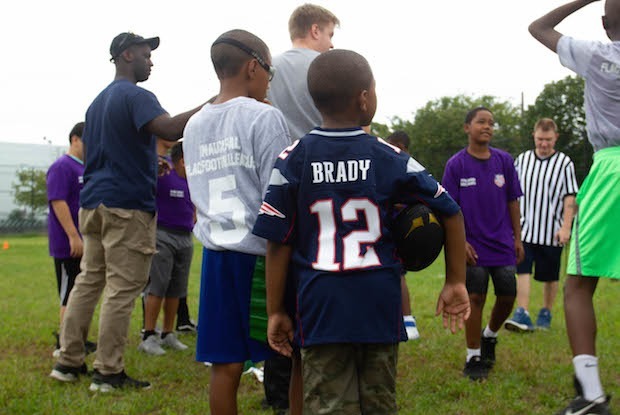 The flag football league, which has attracted about 60 youth participants thus far, is an example of various efforts municipal police departments around the country have recently undertaken to improve relations with young people. They include one-to-one mentorships, such as the Big Brothers Big Sisters of America in Atlanta, and youth-led discussions on how to improve policing. These efforts have gathered pace in recent years, after the deaths of black and brown Americans following confrontations with white police officers sparked protests across the nation. Social Service Research Council director Kristen Lewis said these activities could help young people and police officers “share a positive experience and perhaps see one another in a different light”, and improving police-community relations. However, she cautioned that sport-centered programs for vulnerable youths tend to be skewed toward boys and urged youth-service organizations, including the police, to step up their outreach toward girls. While complementing the potential of such programs to quash misconceptions between both the cops and those they police, Lisa Thurau who is the executive director of Strategies for Youth, an organization dedicated to improving police-youth relations, said the programs should have regular training that helps law enforcement work more effectively with teens. “The police receive specialized training in various areas. Managing juveniles should also be an area incorporated into their training regime,” said Ms. Thurau. Kim Miller, the vice president of leadership and education at the non-profit organization Ross Initiative in Sports for Equality said that such programs are valuable at a time where tensions between cops and marginalized communities remain high. "I think it is all the more important now to step up on efforts to ensure that our understanding of one another goes beyond stereotypes and racial profiling that is rampant on social media," she said. In addition to improving police-community relations, some also argue that sporting initiatives can help lower young people's propensities to commit crime. The United Nations has a $10 million Global Sports Fund aimed at promoting sports to youngsters "at the age when the temptation to experiment with illegal drugs is high." East New York and Bed-Stuy also have among the highest crime rates in the New York City, according to the Department of City Planning. It is worth pointing out that though the rate of illegal drug use occurs at around the same rate in largely minority communities as it does in white communities, people of color are often more likely to be arrested and often serve longer sentences. Bed-Stuy resident Deon Davis-Harris, who manages her a non-profit basketball tournament for youths called Not Just Hoops, said she uses it as a platform for other community groups to advocate public safety and non-violence. "The sporting activity also keeps the kids engaged and away from negativity, like being in gangs or destroying property," she said.